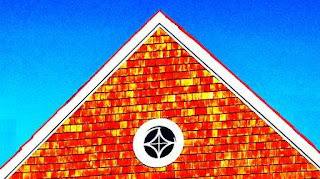 Sometimes it is hard to measure the slope of the roof of the house because of the high position and a difficult climb. There are several procedures described herein. By using the first procedure, the angle of the roof of the house can checked from afar without the need to climb the roof, with simple equipment but with quite accurate result. Note the picture above. Prepare a sheet of cardboard or plywood. Tie a piece of string in the corner of the cardboard, can use a pin or a nail. At the other end of the string tie a weight, a nut for example. Aim or point cardboard upper edge to make it at the same line of roof slope line. As in the picture the roof peak point (A), the bottom point of the roof (B), and the upper edge of the carton are in a line. In the image above it is shown in blue axis. If the roof is being built, then put a sign such as a piece of wood as the highest point of the roof (A), and also mark the lowest point of the roof (B) on the structure being built. Or you can use a first one rafter to check its angle, if it is correct then you can continue installing more rafters to build roof with same pitch angle. Make sure the cardboard sheet really upright so that the string and nut will be pulled by gravity without being distracted. If the thread and nut are no longer swinging, then the thread will be pointing towards the center of the earth as it is pulled by gravity. Hold the string with your fingers in this position, and mark a point (X) which passed by the string with a pencil or pen. The further the position mark (X) of the string's nail the more accurate measurement results. The above picture shows that point X is nearing the bottom edge of the cardboard. After point X is obtained, then draw a line from the nail to point X. 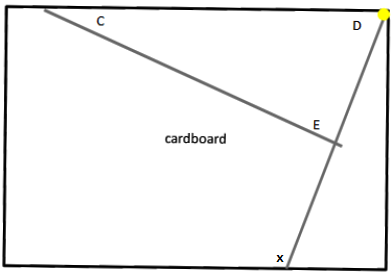 See the picture above, angle D is the angle between the line of string, or line DE, with the upper edge of the cardboard or DC. Measure angle D with a protractor, larger protractor will be more accurate. If you draw a line perpendicular to the line of DX to the edge of the cardboard, it will be seen as the EC line. Angle C is the angle between the edge of the cardboard (DC) with EC line, angle C will be equal to the angle of the roof pitch, that is 30 degrees. DEC triangle describes the shape of roof slope angle that measured. 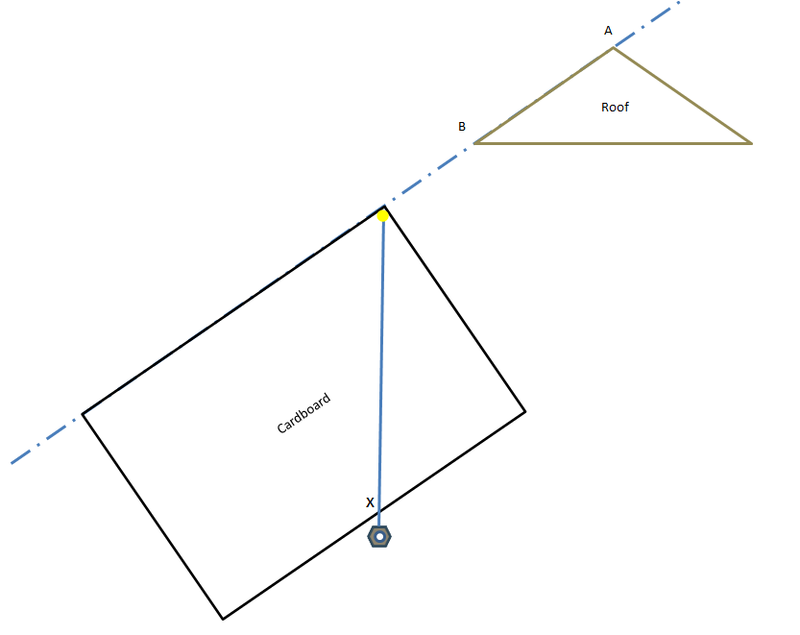 The larger triangle depicted, the more accurate angle measurement. If you do not have a protractor, roof slope can be calculated by using inverse tangential formula (ATAN). Angle C = ATAN (15/30) = 26.6 degrees. Roof tiles, asbestos roofing, and many other roofing has a different pitch angle to ensure no leak. More details can be read in the article "Roof Pitch Or Slope Angle". By using the same tools, the cardboard and string, we can measure the height of the roof and can be done from a distance as described in the article "Measuring Height From A Distance With Triangle". You are looking for best quality laptop at an affordable price?? Various laptop or notebook, desktop, ipad, PDA, brands Apple MacBook, Toshiba, Dell, Asus, Lenovo, Samsung, and much more, with a relatively affordable price, some are protected with global warranty, see "Best Selling Computers". If the measurement can not be done remotely, such as unobstructed view toward the roof. This second procedure still uses the same tool to measure, but it needs to climb onto the roof to put cardboard on the roof. String that is used to tie the weight or nut is shorter in order not to exceed the bottom edge of cardboard. See the picture below. Cardboard is placed upright on the roof. If the roof is not flat, such as roof tiles, it needs use a wooden board or plywood placed over roof tiles, seen in above picture is a green line. String with nut will be pulled down by gravity. Mark the line shown by string. 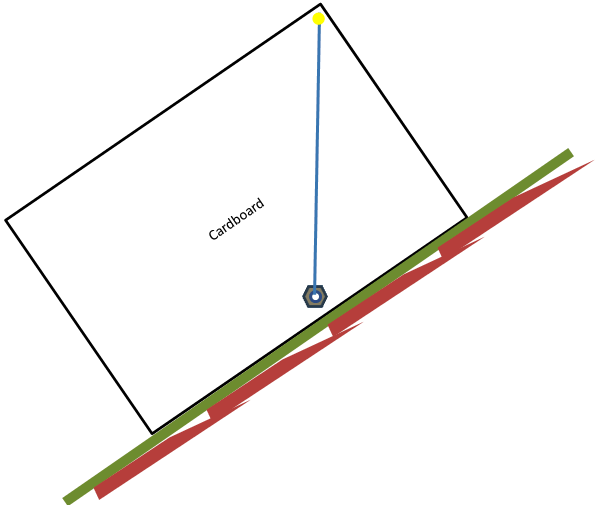 Draw a line corresponding to string position, as shown below. 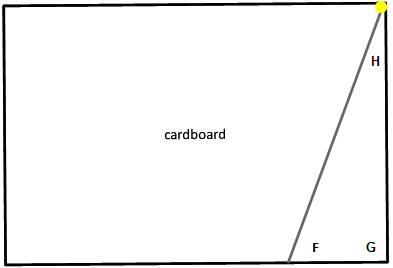 The picture above shows a line that formed by string makes an angle with the bottom edge of the cardboard. This angle is named as angle F. Pitch or slope angle of the roof is 90 - F degrees. For example obtained F angle of 60 degrees, slope of the roof is 90 - 60 = 30 degrees. Note that in this second procedure, the bottom edge of cardboard is used for reference, not the top edge of cardboard. If the cardboard is cut with perpendicular angle so that G angle is 90 degrees, the angle of the roof will be the same as the angle H.
The third way to measure the slope of the roof is to use a spirit level, please see the image below. This method should also be done on the roof alias must climb onto the roof. Position one end of the spirit level on the roof, make sure the spirit level is really level. If the roof does not flat it is necessary to use a wooden board or plywood, in the picture it looks green. 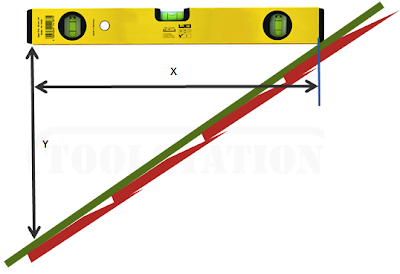 Measure the height of the other end of the spirit level on the roof, the result will become the value of Y. Y line must be really upright to spirit level, preferably using an elbow ruler to measure Y. Spirit level length will become the value of X. By using the inverse tangential formula (ATAN) then the roof slope can be calculated. This method requires a special tool that is a spirit level, and it is hard to be done by one person, especially as it needs to climb the roof. Especially for the second and the third procedure, please consider the safety because those procedures need to climb onto the roof. It should be done by two people in order to help each other and they can help each other in case of an emergency situation. Do not let the roof is damaged as you climb it, or even you are injured as you fall from the roof. The best time to climb the roof is in the morning, because the roof is still hot. When scorching daytime, roof can heat up and the skin will blister if touched the roof. Climbing with footwear and bring a wooden board to avoid direct contact to the roof may help if you still had to climb on a scorching day, wet your body and clothe with water also helps. After rain is also good time for climbing the roof because the roof is cooled by rain water, but sometimes the roof became slippery due to wet. Currently available digital tools to measure angle and can be used for measuring the roof pitch angle. 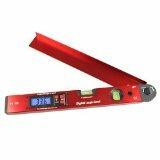 The 'Wixey Digital Angle Gauge' can measure tilt angle relative to the Earth's gravity. Equipped with a magnet in order to stick to the metal iron or steel, making it very suitable for measuring the angle of a saw blade, also very suitable to check tilt angle of steel frame structure. More details here. Angle gauge (protractor) that uses the crossbar is also equipped with a digital display. Like 'General Tools 822 5-inch Digital Angle Finder Rule' on the photo. This tool can measure the angle of the roof of the house if used in conjunction with a spirit level. Spirit level is used to ensure upright position of one ruler of the angle finder. It is also can use a string and weight to check upright position. String is tied on to one ruler and the weight will be pulled by gravitation, thus upright position of that rules can be determined. Some protractors have already equipped with spirit level, such as the red one on below photo. Angle finder can also be used to measure the angle between two walls, corners sills, and others. More details here.